Often on side resting vehicles, once a strut is placed the fixed end of the ratchet strap is too long to tighten the strut. Often on side resting vehicles, once a strut is placed the fixed end of the ratchet strap is too long to tighten the strut. First off, if you are using a cluster hook set, use the smallest hook possible. Secondly, if possible use the hook on the fixed end of the ratchet strap. Finally, you can gain approximately 6 inches of space by folding the fixed end strap in half and attaching the hook on the handle as shown in the picture below. The battery weight and location are important considerations for stabilization. One of the fastest methods of initial stabilization is to immobilize the vehicle by turning the 12-volt system OFF. Securing the ignition is accomplished by obtaining the key fob or keys and put them in a rescue apparatus Furthest away from the scene. Another quick, initial stabilization option are wheel chocks. Chocks used during fire pumping operation are an excellent option. However, often a line is stretched off the apparatus and the engineer used the chocks on the apparatus. Many extrication teams use two wheel chicks tied together with a rope. Turtle Plastics has chicks that are lightweight and easy to deploy. Stabilize the vehicle with cribbing, by removing air from the tires, or utilize the Lift Airbag Equipment for rescue. Wheel chocks must match the size of the tires on the vehicle and used in pairs Tire size is designed to be proportional to the vehicle’s weight and size. The angle of the road surface, called slope or grade. Parking on an angle greater than 10 degrees increases the risk of the car rolling off or over the chock. The size (height) of the wheel chock compared to the wheel height. Extra large wheel chocks are suitable for e.g. parked air craft where wind forces may come into effect. The surface slip or friction of the road surface, as the wheel chock may slide downhill due to wet grass or ice. Increasing the size of the wheel chock will not necessary allow the parking on inclines greater than 30% gradient (16.6 degrees). Keep in mind, the vehicle most likely will require full stabilization which should include cribbing and struts where necessary. 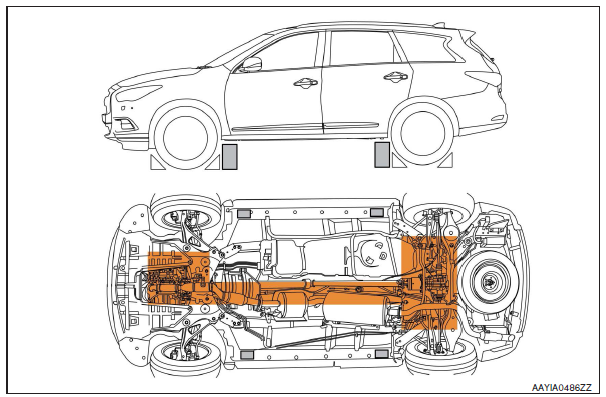 Vehicles like a side resting vehicle or roof resting require struts to stabilize. The Associated Wire Rope Fabricators, INC Facebook is a great page for tech rescue personnel to follow. Below is a image that was posted on their Facebook page under the title “Never saddle a dead horse!”. 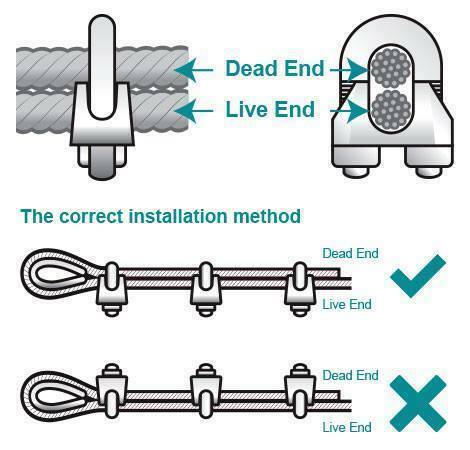 The image explains how U-Bolt Saddle Clamps should be used on wire rope. Vehicle stabilization at an accident scene is an important step in patient removal from a vehicle. Movement of the vehicle needs to be eliminated and for a vehicle with all 4 tires on the pavement this is often achieved with cribbing the rocker panel and removing the air from the tire. The air pressure can be removed from the tires with multiple methods. Two methods that are smooth and fast include pulling the valve stem out of the rim or cutting the valve stem. Many late model vehicles are equipped with a tire pressure monitoring system can prevent pulling the valve stem. These systems have an integral transmitter attached to the value stem inside of the wheel. Snapping the valve stem with pliers or removing the valve cap and Schrader valve will release the air in the tire. Integrated pressure transmitter attached to the valve stem inside the wheel. Some vehicles have low profile tires that have a small sidewall of the tire. This can cause an issue during vehicle stabilization when tires are deflated. The small height of the sidewall of a low profile tire provides less room for the tire to collapse without air.